Have you ever had an afternoon snack and then taken a little nap afterwards? And did that biscuit and glass of milk came back to you in psychadelic dream form, filling your head with colorful visions of how you never really graduated from primary school but need to do it all again, naked? Have you ever marvelled at how vivid and imaginative those dreams can be? How internally consistent they are, but how difficult they are to describe in waking life? Well, we could say the same thing about Hayao Miyazaki movies. Except for the naked bit. Transcendental anime. Shades of Madeleine L'Engle, too. 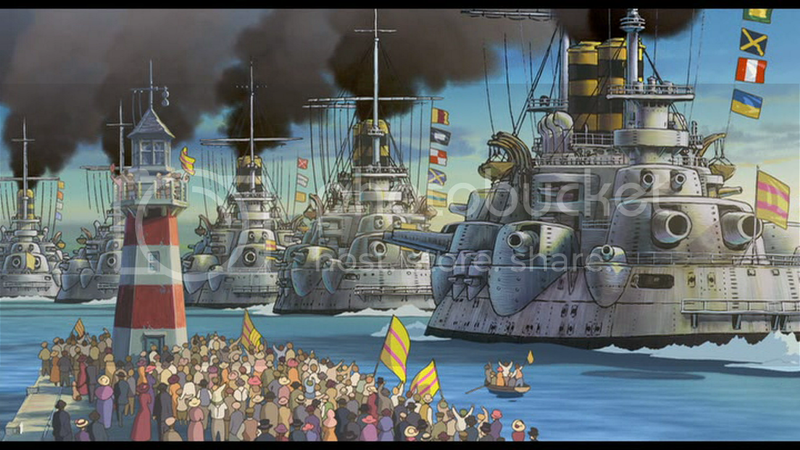 Howl's Moving Castle takes place in some sort of alternative universe Europe from the late 19th, early 20th century. The surrounding countryside could be the south of France, or Monaco, or Switzerland; the buildings could be from the London of H.G. Wells. Our heroine is Sophie Hatter, a self-described "plain" girl who makes hats (ha ha) and sort of hangs around. Her country is at war, and one day, when the soldiers go marching off to trumpets and parade banners, she wanders down an alley, is waylaid by some leery soldiers, and is saved by the anime version of David Bowie. This turns out to be the titular Howl, owner of the castle and wizard extraordinare. Howl's got some Blobbies of Doom (relatives of the Squigglies of Hate, no doubt) on his tail, and so he promptly escorts Sophie up into the clouds. This is a lovely scene. 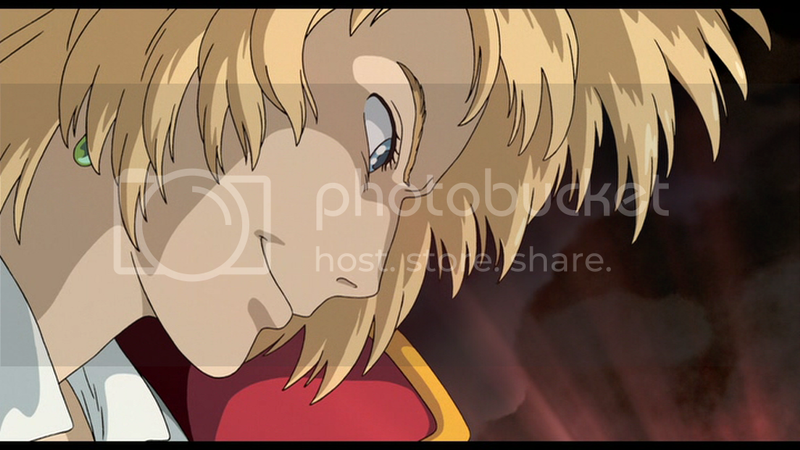 Howl, played by the anime version of David Bowie. Anyway, Sophie's all like, "Wow! Cool!" 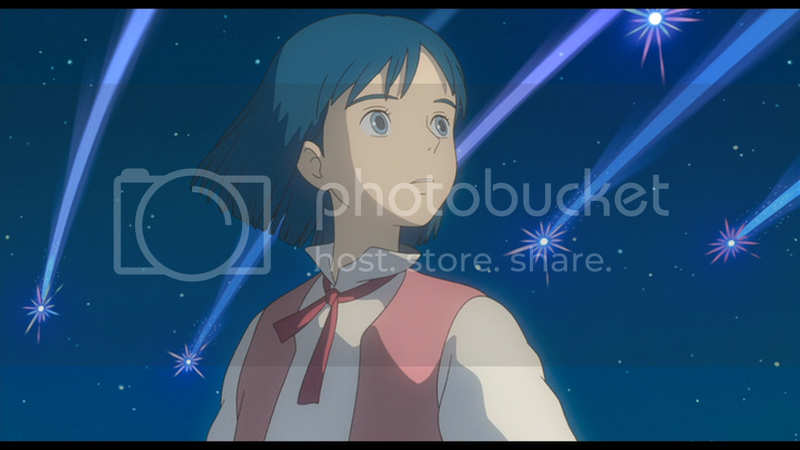 and Howl's like, "OK, seeya later." and Sophie's like, "Oh." A few days later, the fascinatingly fat Witch of the Waste shows up in Sophie's hat shop and promptly casts a spell on Sophie, reducing her to a shrivelled old lady who looks about 200 years old. The ever-plucky Sophie decides the only way she can get rid of this spell is to find that Howl guy, and off she goes, into the Sound of Music mountains to find his castle (which moves, inconveniently). Along the way she befriends a scarecrow who, yes, has a brain but cannot speak nor walk but only hop. She finds the castle, we are introduced to new characters - the adorable little boy, Markl, and the very cute fire demon, Calcifer - and Sophie meshes well, even though Howl is an idiot and has no idea that the Old Sophie he hired as a maid is actually also the Young Sophie he flirted with earlier. Or maybe he does know, and we're the idiots. WHOA. Witch of the Waste. That's about as linear as we can make it, and that's only the first 20 minutes of the film. Just watch the rest of it, it's very worth it. Onto our thoughts now! Old Sophie, and Howl sporting his Black Raven look. Well, we always like Miyazaki. And by "like" we actually mean "are blown away by". The man is a genius. He must have a circus in his head; a circus of GENIUS. You can see the genius in those moments when these little drawings stop to wipe their skirt or check their shoe to see what they stepped in; never have we seen such realism in animation. And such wonder! 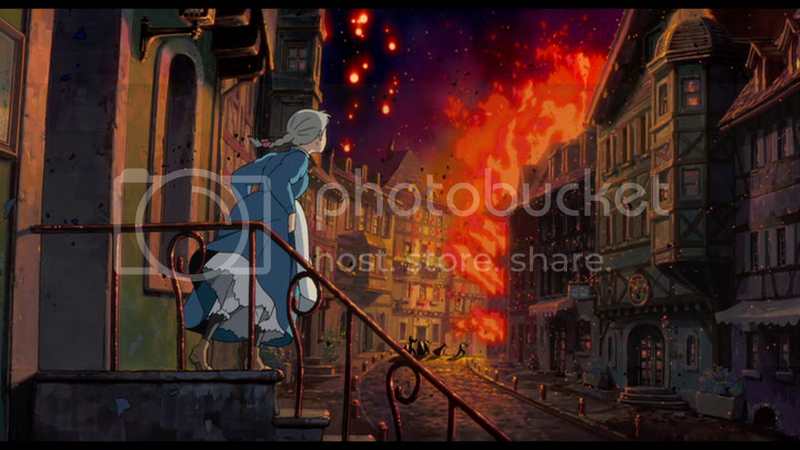 Every scene was an explosion of vividness and color, every little whir and wheeze of the moving castle itself was so meticulously there. In terms of imagery, it was fascinating and fun, and we were reduced to children with slack jaws going, "Wooo-ooow." 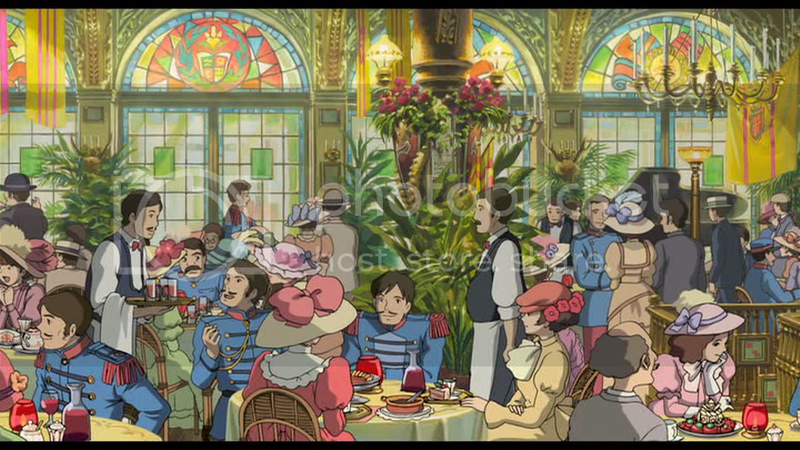 Despite the ending, which seemed somewhat too pat compared to Miyazaki's other works, the narrative was generous but never straightforward, and certainly never anything we could have expected. Goodbye, grounded and familiar land of cliché! 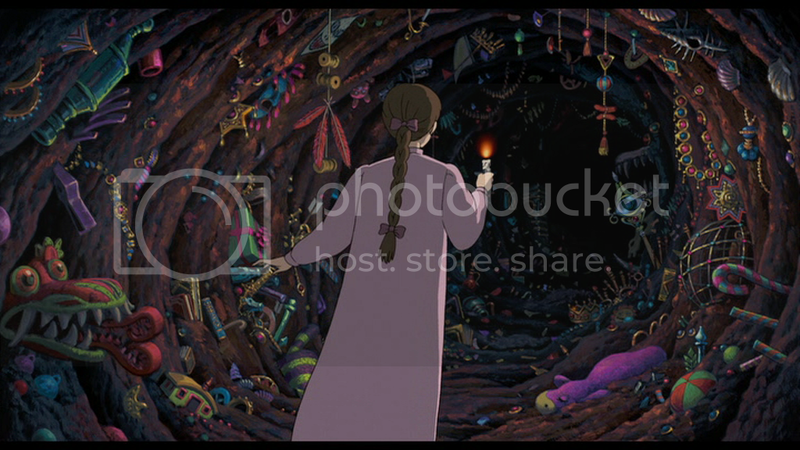 Just as we sat entranced and morally confused in Princess Mononoke ("Who's the villain? Where the hell is Scar when you need him! 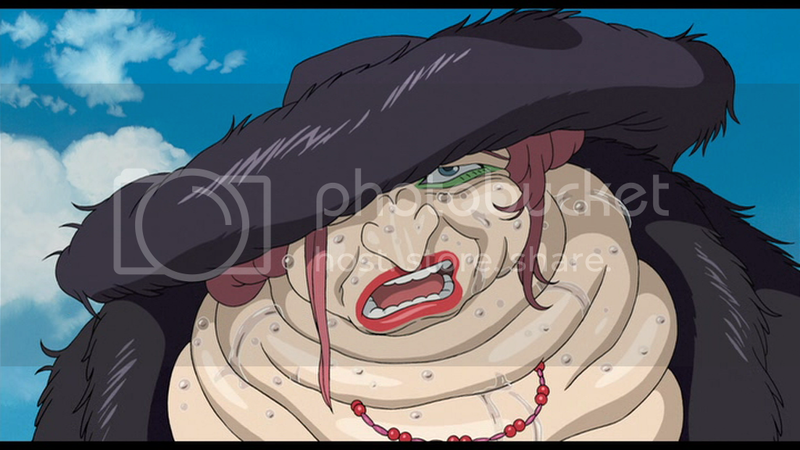 "), so too did Howl's Moving Castle make us completely reevaluate characters. These are cartoon characters. We were reevaluating the morality of cartoon characters. THAT'S WHY HE IS SO GOOD. The war hits close to home! Then there are the ever-present themes of pacifism, flight, and personal evolution. We highly recommend reading Wikipedia's article on Hayao Miyazaki, which talks about his recurrent visual motifs and influences. And we highly recommend indoctrinating your children in Miyazaki, as his films will provide some welcome relief and freshness from the overly manipulative, overly morally-bland (Simba good, Scar bad) Disney standard. a bit late i know, but i would like to add that this movie was based on a novel by english author diana wynne jones. 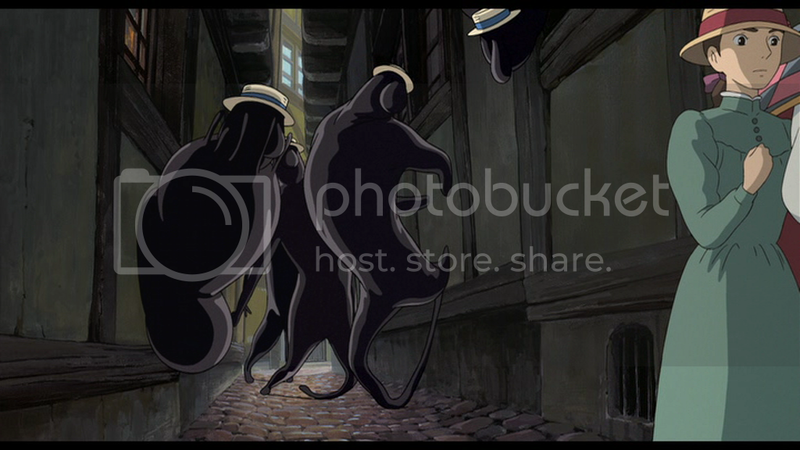 I love this movie and also watch his other films: esp loved My Neighbour Totoro, Princess Mononoke and Spirited Away. Beautiful animation, stories and character: a joy to watch. Discovered British author Dianne Wynne Jones thru this movie and couldn't understand how I hadn't come across her before, avid reader that we all are. the image of sophie in the cave isn't working! Hi there, I've read your comment and I quite agree on how great a genius Hayao Miyazaki is. His work really flashes unparalleled in the animation world, amazingly original interpretation on D.W.Jones' work for Howl's. But about evaluating the character of cartoon characters, I think there is absolutely nothing wrong with it, especially so when they are created with so much detail and effort. 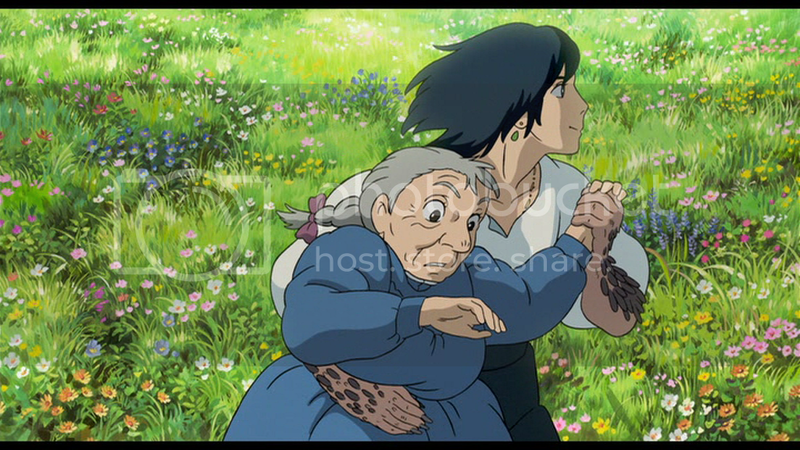 As seen in the characters by Miyazaki, who are of a totally different caliber than cartoons that are meant for children. After all, we can't compare the Three Little Pigs with The Little Prince, can we?